This quick and easy red-coloured dish goes perfect with red wine. Heat the olive oil in a large frying-pan, add the onion and stir-fry over medium heat for 3 minutes until translucent. Add the garlic, stir-fry for 1 minutes. Add the sliced chorizo, chickpeas, paprika powder and cinnamon sticks and stir-fry for further 4-5 minutes over medium-high heat. Season with salt and black pepper. 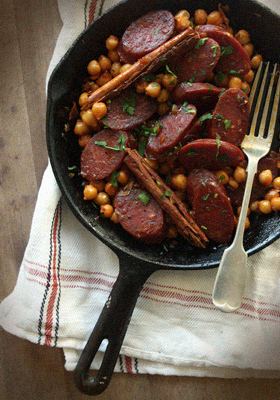 § 4 Responses to Chickpeas with Chorizo"
Always the best photos! And chorizo! Here in California it is the staple sausage of Mexican cuisine. Great post! Aww, I love Mexican food, I wish I was in California right now! As aylaws Matthias you have captured a very unique location. I love the sky here, it helps with the message of this photo. 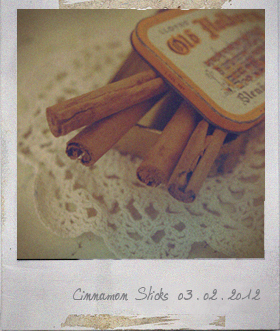 Great shot man!P.S. Congrats on making photoblog.org Hot list!!! I was so happy to see you made it, I love your photography and think you defiantly deserve it! You are currently reading Chickpeas with Chorizo at Fish Trip Cafe.